The 12′ x 6′ Traditional Standard Apex Shed is a very nice looking and large storage shed that is going to be able to keep a whole lot of items safe from the weather and from thieves. With its vast amount of floor space and generous headroom this is a shed that is offering you all the storage space you could ever need. The large size would easily allow this to be used as a workshop which is great for you DIY enthusiasts. With six large windows, natural light is just going to beam inside the shed and make being in here a very pleasurable experience. A good sized door has been used so that you can bring larger items inside the shed and get them back out again without any hassle. This huge shed has been made with some very impressive materials such as the awesome looking, 12 mm thick, tongue and groove shiplap cladding that has been used for the walls. A round edged, solid frame is behind those walls making this a structure that is built to be strong and last. Both the floor and the roof are fantastic thanks to being comprised of tongue and groove boarding which gives them a very attractive look that goes with the rest of the shed as well as making them be able to take a lot of weight. The apex roof has a wonderful design, but it is also going to make sure the rain does not get into the shed. Here we have a very classic looking style of shed from Treetops Traditional, the 12′ x 6′ Traditional Standard Apex Shed. 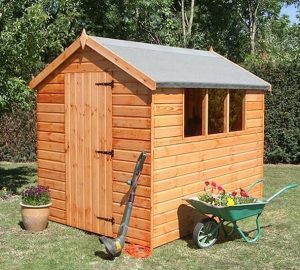 If you need a whole lot of space then that is exactly what you are going to get with this shed. 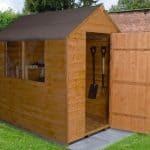 Offering you an incredible, 12 feet of depth which gives you a whole lot of room to make use of along with 6 feet of width, this is a shed that really did impress us with its sheer size. The height is just as impressive as the floor space that is on offer. The height along the ridge is 7 feet 1 inch making being inside the shed see you able to walk around upright. At 5 feet 6 inches high, the eaves height is right around what we would expect from a roof like this. Treetops Traditional have not cut any corners with the roof on this shed. To start with the boards are 12 mm thick tongue and groove boards that have a lot of strength and can take the weight of even the heaviest snow fall. Covering this, they have used some high quality roofing felt to protect those boards and what you are keeping under them from the rain. The good looks of this shed are because of the tongue and groove shiplap cladding which has been used. We really like this style of cladding as the way it fits together does not allow any hidden areas for the rain to get in. At 12 mm thick it is also very strong and robust making the shed a very strong structure. Speaking of strong structure behind those walls is a very good sized and sturdy frame. Treetops Traditional have a real trademark frame that they like to use in most of their sheds and it is one of the best frames out there. 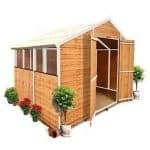 It is a very nice size at, 44 mm x 27 mm and with its rounded edges it makes this a shed that is going to be able to take a lot of abuse from the weather and stand strong for lots of years. We really do love how Treetops Traditional use 12 mm thick tongue and groove boarding for the flooring of their sheds. They use this for the roof as well and from a design point of view it really does look great, but it is because it is so strong that it is just ideal for a shed like this. A shed of this size is surely going to house a whole lot of things and thanks to this flooring it can easily take it. This is the type of floor that is going to be able to take many heavy items so make the most of it and really load this thing up! The shed will be given a free basecoat treatment which will keep it safe while it is being transported and also while you are putting it together. A proper coating of wood treatment is required shortly after construction and also once a year. A fresh coating annually is all you need to do in order to make the shed last many years. You are covered for one year with this shed so if there is any issues that do arise then they will take care of them. 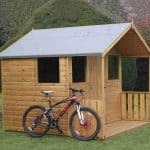 Thankfully this is a well made shed as the guarantee they offer is not as long as what some other manufacturers offer. 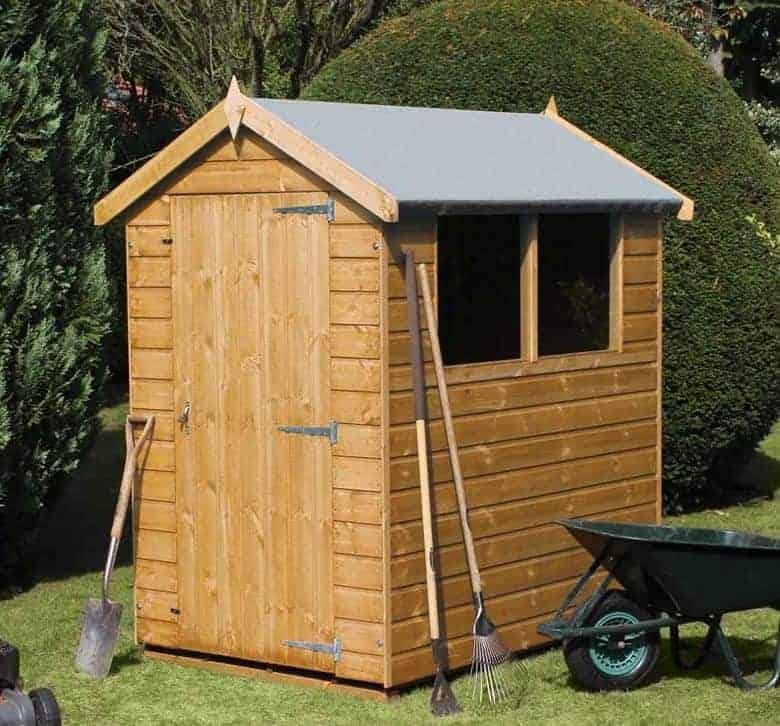 As standard the 12′ x 6′ Traditional Standard Apex Shed comes with a solid 2 feet 6 inches wide and 5 feet 9 inches high door. This door is very secure thanks to the three heavy duty hinges holding it in place. The door in the pictures is the one that comes with the shed, but you can request a stable style door be included. Also if you are willing to pay the extra £53.99 then you can upgrade to a 4 feet wide double door. If you plan on putting large items inside here then this is something worth considering. The shed comes with six large fixed windows that are made with horticultural glass so they look good and are also very strong. This is a lot of windows for a shed to have so you are going to get plenty of natural light inside here. If you are worried about things getting a little bit stuffy inside of here then the windows can be upgraded so that they can open, this will cost you, £31.99 per window. The shed comes with a lock and key as standard which with so many sheds making you buy a padlock is a very welcome addition. This allows you to store a few more expensive items inside of here and then lock them up safely. As the shed has six large windows it is not offering you much privacy, but Treetops Tradition do offer you the option to make the shed fully boarded so that there are no windows at all. This does not cost you any extra, but it also does not make the shed any cheaper either. Thanks to being able to change the door and decide if you want any windows, this shed does allow you to get a little bit creative with its design which is something we like. Using coloured wood treatment is another way to change the look of the shed and something we recommend you do if you want to liven it up a bit. Treetops Traditional do have a couple of extras for you to think about. First of all is their installation service which costs, £104.99. To make the floor more secure and raised a few inches they offer a set of wooden floor bearers at a cost of £47.99. We always expect a Treetops Traditional shed to be of high quality and this shed is certainly that. The materials used are very impressive not just in their looks, but their durability as well. With just a coating of wood treatment once a year, this shed should last you for well over 20 years. 12 x 6 is really all the room you could ever want. The size that this shed offers you will not become apparent until you stand inside it for the first time and realise just how huge this is. Even though this is a large shed, building it should be a rather straight forward process and take between 4-6 hours. Following the instructions, diagrams and taking a tea break every now and again will see you get through this stress free. 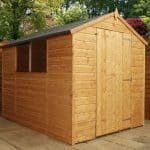 This is not a cheap shed, but the materials used and the huge amount of storage space still make it excellent value for money in our eyes. Final Thoughts: While you can see from the pictures of the 12' x 6' Traditional Standard Apex Shed just what a great looking shed this is. It will not be until you are standing in its presence or when you step inside it for the first time, you will realise just how huge this is. Storage space is the main reason that you would buy a shed like this as it offers you just so much. 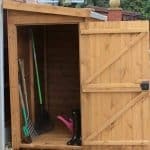 If you do have a whole lot of things you want to be kept tidy, safe and well organised then this shed will give you the space to do that. Also the size would allow this to be a very cool workshop as well. 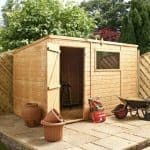 In all this is one very impressive shed that we highly recommend to anyone in the market for something that offers a whole lot of space to make use of.